FNSI? Totally blew that this month! Wow! Totally blew off FNSI this month! I signed up (I was so excited because I was actually the 2nd person to do so!) then totally forgot. LOSER! But I have been very busy! 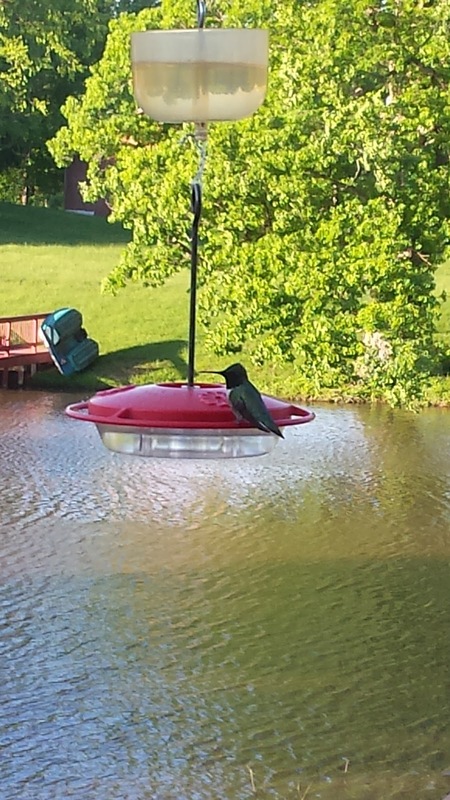 On a happy note, here's my first picture of the year of a hummingbird getting some much needed refreshment after his long journey! 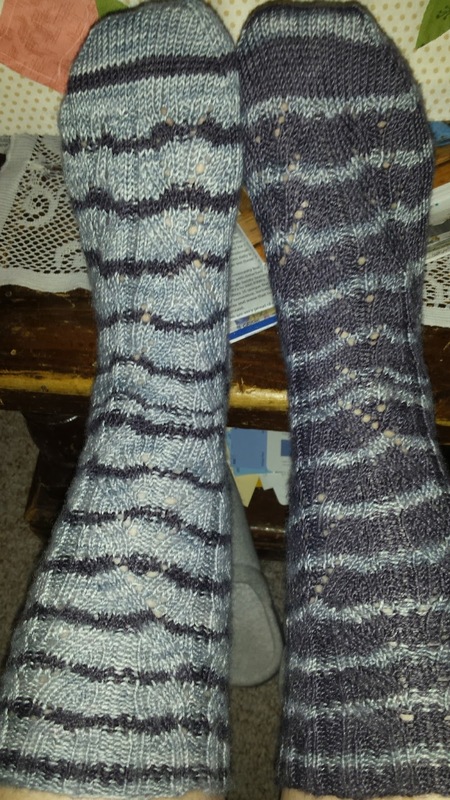 I managed to finish my 2nd pair of socks this year. I need to get another pair on the needles. If I'm to get 6 pairs done this year, the next finish should be completed by the of June to stay on track. This was really cool yarn I found a loooong time ago online. It starts out looking like the first picture (kind of swatchy), then mine turned into socks that look like the 2nd picture. I've got several more swatchy things in different colors, so no excuse for no more socks! 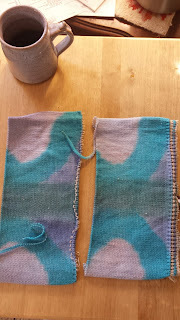 I also started a very relaxed Ravelry knit-a-long. 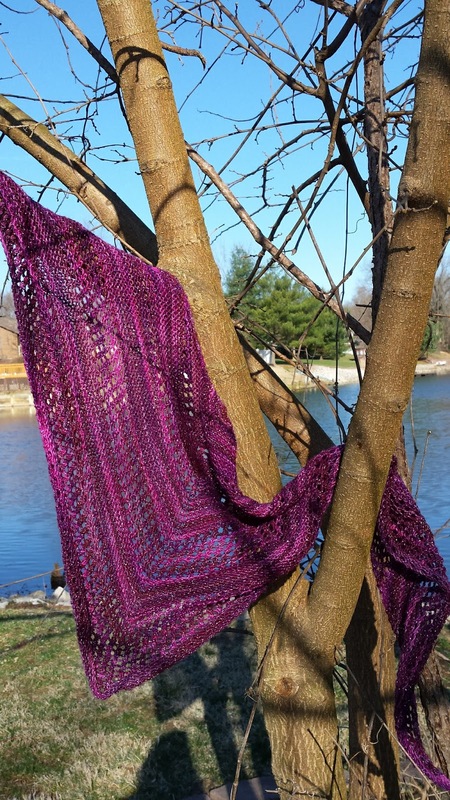 We are knitting the Rhapsody Shawl by Mary Ann Lammers. It started May 1 and goes through July 31st. Mary Ann describes it as a front porch-sitting project. It's the perfect piece for me to knit while watching Gilmore Girls. My daughter got me addicted to it and I just finished up Season 5. I started watching it while Sarah visited over Christmas vacation. Only 2 more seasons to go and then the recap episode. 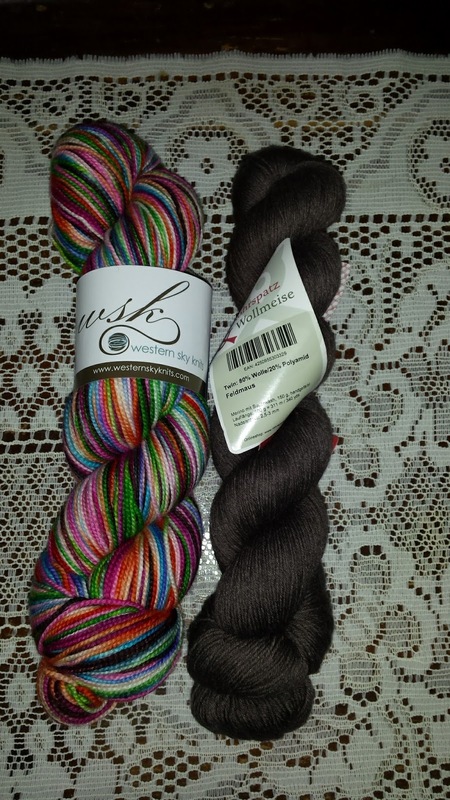 Anyway back to the KAL, We all bought Mary Ann's pattern, a skein of multi yarn, and 2 skeins of a contrasting solid. Here's a picture of my yarns and another of my progress so far. Count those colorful stripes -- yup! 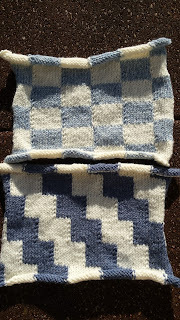 12 down & 8 to go, then next pattern to knit follows. Now hold on because I'm not done. 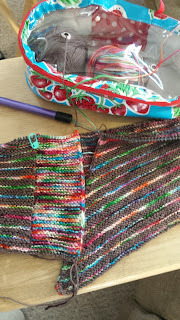 I started another knit-a-long on Ravelry with Joji but this one is a mystery. Got my 5 colors of yarn into balls and started it yesterday. This one she described as a large wrap and it is looking like a shawl so far to me. But don't count on it since I'm only knitting Step One currently and Step Two has already been published. I'll catch up but it'll take a more time. 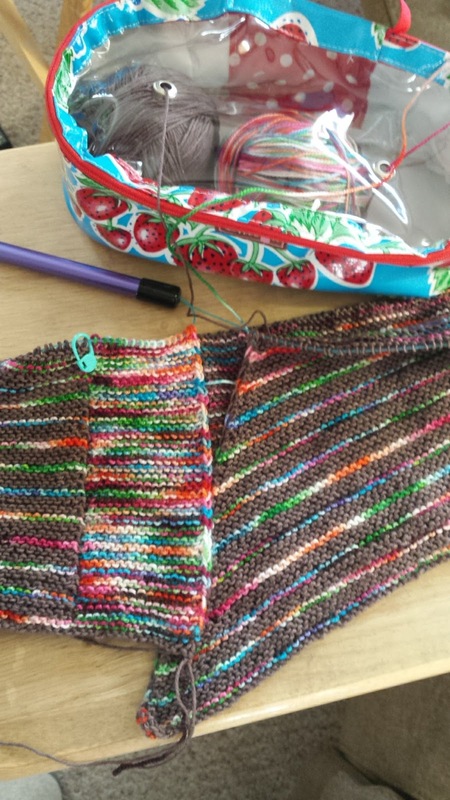 This project promises to be a little fiddly with knit-the-back-loops, purl-the-back-loops, and probably more such things when I get to that point! Here's my progress so far using the first 2 colors with #3 (the multi) coming up next. That's 14 completed rows so far. Only 62 more rows until Step 2! Go, girl, go! And just when you thought I was through, there's one more knit-a-long that I'm seriously so far behind that it shouldn't be considered a knit-a-long with me. It's a freebie from Rowan yarns and Kaffe Fassett is the designer. I made these blocks while taking my mother to her 65th High School reunion last month but when I got home, I discovered they were way too big. What did I do? I went and bought more yarn and will start working on this project again with smaller needles. Will probably work on these blocks in the car on my way to Colorado next month (I might start sooner but I surely have enough to keep me busy until then!). My niece has another softball tournament really close to my sister's house in Denver during the last week of June and my nephew, who got an appointment to the USAF Academy, has to report to Colorado Springs during the week of the tournament! It's all perfect timing so there will be a van-full of us heading west! On the quilting front, I am working the Spring International Quilt Market which is being held in St. Louis this year. It's quite the experience and I plan on getting there early today so I can browse some of the booths. I worked set-up day but it was utter chaos in there! Hahahaha! This project is calling my name 24/7 but I have resisted. Well, I did cut a few more fabrics out but that was all. I can't wait to sit down with this one and whip it out! 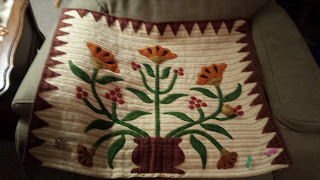 Have a peaceful Sunday while I go see what all the excitement is all about at Quilt Market this afternoon! Definitely a distress signal for me. April completely disappeared off my calendar this year. I guess between wrecking my car and the scramble for a replacement in March followed by Easter and then taking my mother to her 65th high school reunion in New Jersey in April, it just did me in. Whatever! Let's move on ... As I recall I promised to share my latest knitting projects. 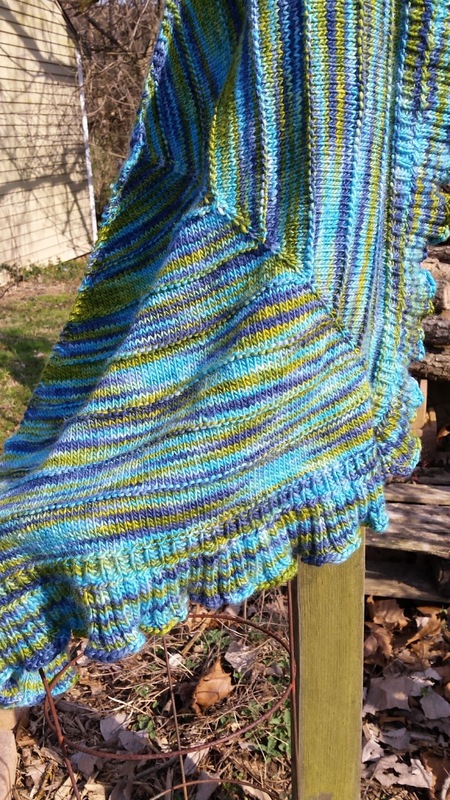 The first shawl is Boneyard Shawl with Mara Shawl's ruffled edge. I used the yarn I got with Warm Woolies club through The Loopy Ewe. It's a nice weight and size and should keep me warm in cooler weather ... or in the house while the heat is off. 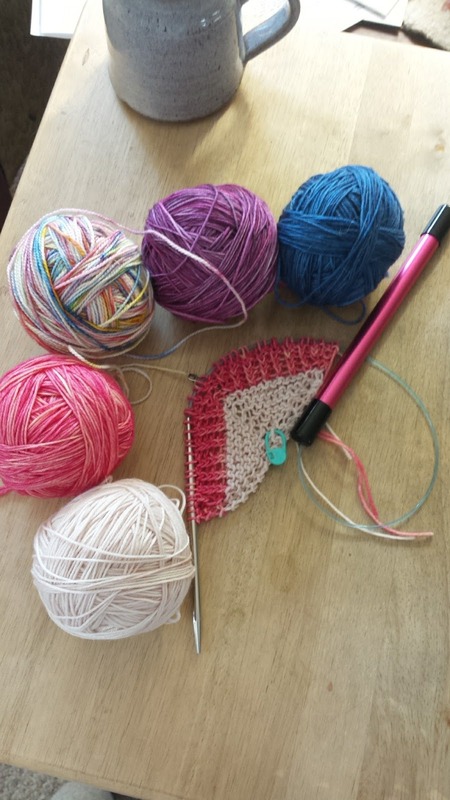 The middle picture is of my Reyna Shawl, also using yarn from Warm Woolies Club. It's a lighter weight yarn and the pattern is lacy. I've used it several times already wrapped around my neck. It's beautiful and I wish you could see the sparkles in the yarn! 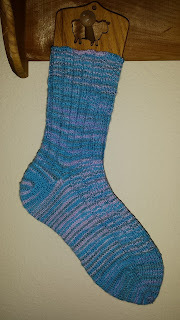 My socks are a fun pair knit with Inversibles yarn. The yarn was dyed in opposite colors so where you see light silver on the one skein, there is dark silver on the other. The yarn is dyed by Fibernymph and you can get all kinds of double-color combinations from The Loopy Ewe. Think team colors or school colors! The pattern is Cadence and it's a freebie from Very Busy Monkey. (All of these patterns can be found on www.ravelry.com . 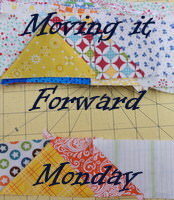 As for quilting, I have some sharing on that today too! But first the disappointing news. The APQ 2017 UFO Challenge selected #11, which was my Winter Snowmen. 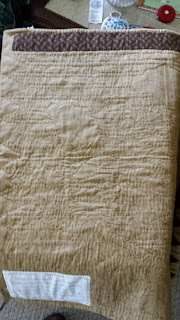 This project has been sitting for years and needs to be quilted. It is exactly the same, never touched this year. For May we are to work on #2 which is my Alex's Stars Round-a-Bout. 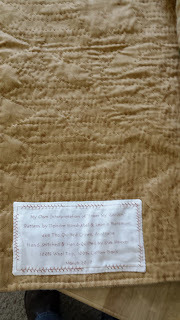 Can't remember the official title to this quilt top but that's what I called it to refresh my memory. So far I've gotten it out to measure so I can purchase my batting. 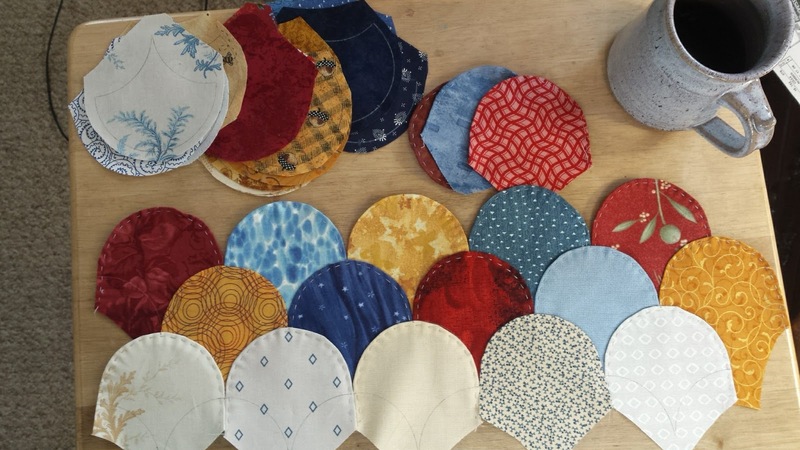 It's already MOSTLY marked for quilting so I need to finish that up then I'll be good to go! Remember this project? 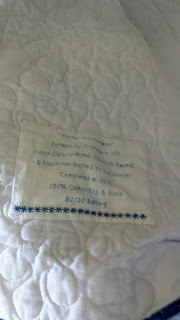 I not only finished the big-stitch quilting but got my sleeve AND label on. I pretty much copied my friend Katie's and my sister's ideas for personalizing and made it my own! I am thrilled to cross this one off my list! 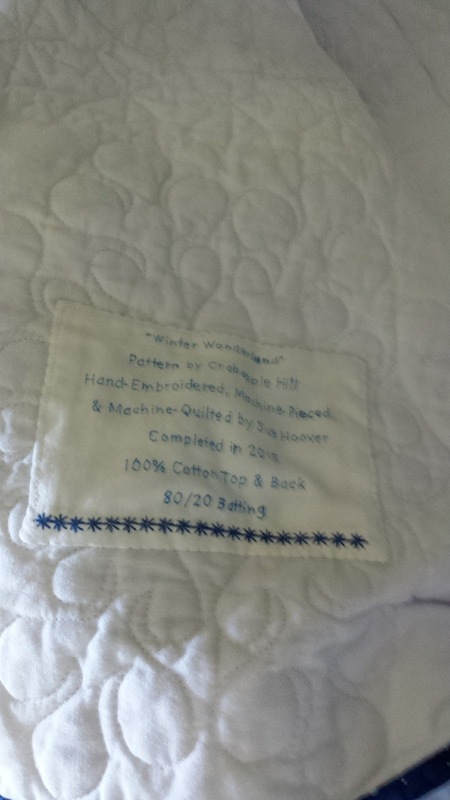 Here are also a couple pictures of the back so you can see my label and some of the quilting. 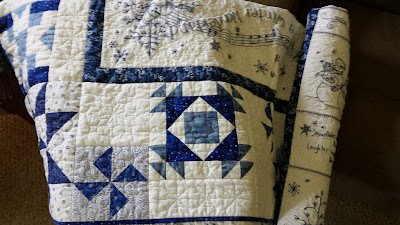 My guild has a quilt show every other year and this is the year of the show! It's really motivated me to having my labels done and sewn on. I may put this one in the show. Here is a "teaser" picture of my Winter Wonderland quilt. I finished it quite some time ago but never made the label. 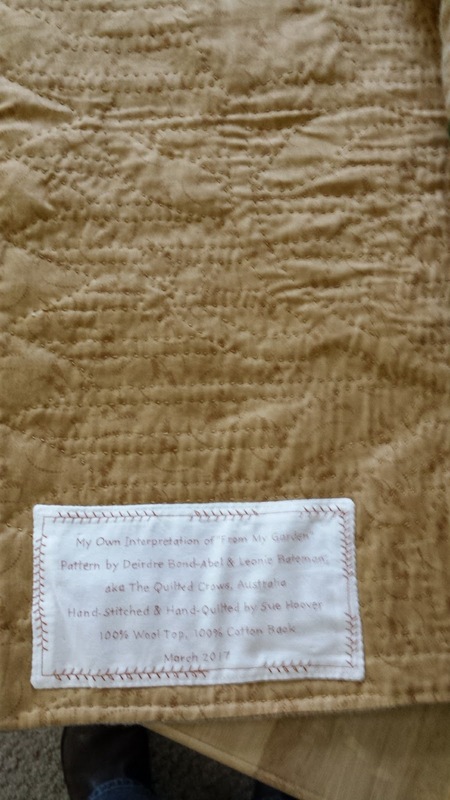 It has been entered into the quilt show so it was time for a label. You can see I did a fancy-schmancy label here too! I machine quilted it on my Bernina and I love it. I also entered my Dresden Stars. I don't have a picture yet of it finished and I also don't have a label for it yet. That'll be done this weekend. This is a photo of my Witch's Boot which is also entered in the quilt show. I changed the border up instead of the called-for one. I like my version much better. Not sure if it has a label on it. Better dig it out & check! 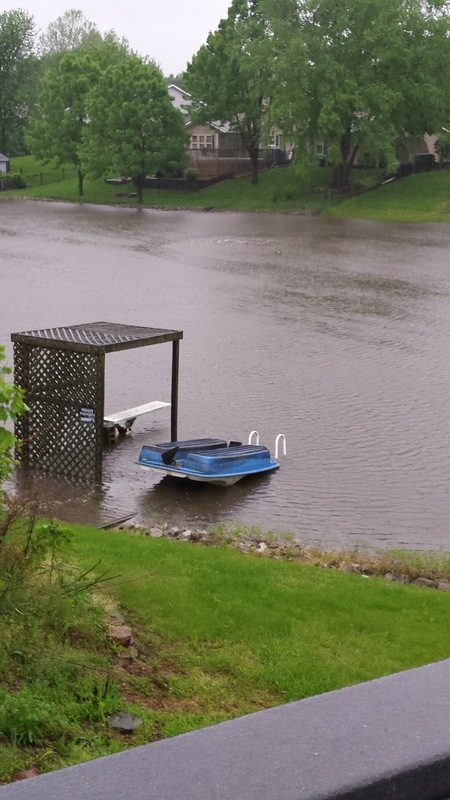 In other news, we've had an awful amount of rain here in the St. Louis area. So much so that I thought I'd share a picture of our dock on the pond. Ridiculous amount, wouldn't you agree? I thought our paddle boat was going to float away! Thankfully the water is going down. Which is a good thing because the International Quilt Market - Spring is going to be held here in St. Louis in a couple of weeks. I'm looking forward to helping out with it ... signed myself up yesterday! I hope to see some of the ladies whom I follow their blogs!! A last couple of pictures: Gracie was thrilled that the rain was gone this morning and the sun was shining brightly. 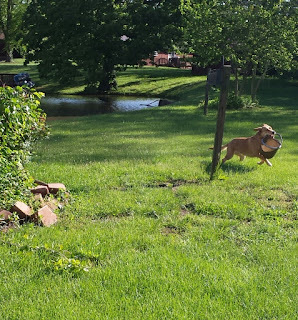 She was doubly thrilled when she pulled a treasure out of the pond -- a potting bucket! 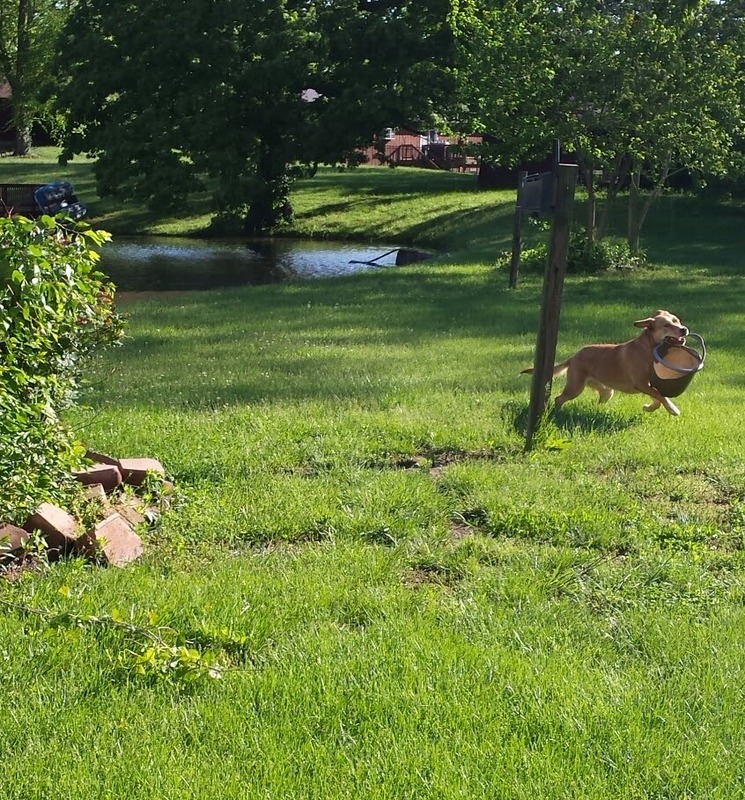 What a happy pup runing with her new prized possession! Happy Cinco de Mayo! Mom should be here any minute now to go to lunch with me. We're headed to Catrina's in Edwardsville, a favorite Mexican restaurant of ours! Have a great weekend! Ole!